Leonardo has signed with the Italian Defence Ministry two contracts. One for a first batch of five Aermacchi M-345 trainer jet and one for the first phase of development and delivery programme of the new Italian Army helicopter. Mauro Moretti, Chief Executive Officer and General Manager of Leonardo, said: “The signing of these two contracts is the result of constructive discussions between the Italian Government and industry, which helped identify the requirements and the best technological answers. The Italian Air Force has a total requirement for around 45 M-345s (designated as T-345 by the Italian Armed Forces) to progressively replace the 137 in-service MB-339 aircraft which entered into operation in 1982. 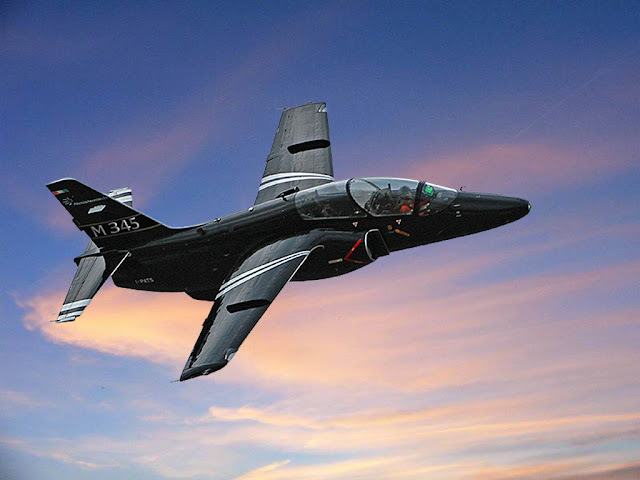 The new aircraft will work alongside the fleet of 18 twin-engine Aermacchi M-346s already ordered and currently used by the Italian Air Force for the advanced phase of pilot training. Together, the two aircraft types will form the world’s most advanced training system for military pilots. The M-345, thanks to its high performance and advanced ground-based training systems, will provide the Italian Air Force with a significant boost in the effectiveness of training, improved efficiency and a reduction in operational costs. The first delivery is expected by 2019. Through this new programme, based on a total requirement for 48 units, the Italian Army will be able to replace the current fleet of AW129 which are expected to be retired from service by 2025 following over 35 years in operations. The NEES programme will benefit from the long operational expertise gained by the Italian Army thanks to the AW129 and from the know-how of Leonardo in this specific helicopter sector. It will allow the service to introduce an even more technologically advanced product, with greater performance and lower operating costs, to meet arising needs in evolving scenarios for the next 30 years.